The charm and tranquility are the distinctive signs of this cozy apartment, located in a building in a very pleasant and calm street. Our beautiful apartment offers all kinds of comforts: living room with kitchenette, washing machine, fridge and electric hobs, iron and ironing board, central heating, hair dryer, sheets and blankets, towels. We also have a nice balcony with a table where you can enjoy pleasant breakfasts or spend romantic moments at the candle light. You will be in a silent situation but 5 minutes from Rome Center and Vatican Area. Small apartment not quite like photo. Small but comfortable apartment with two rooms and small bathroom. View from the window is St Peter's Basilica. Apartment is on a street off the beaten track so it is a 20-30 minute walk to the Vatican Museums. The Roma S. Pietro train station is very close to apartment so if you are comfortable with the train system it is a 1-change trip to the airport. Cutting through the train station will shorten your walk to most every place you need to go. Grocer is on Via Gregoris VII about 2 blocks west called Carrefour Market. Apartment kitchen is very small and could use a counter top light. Taxis in Rome are reasonable and prompt. Uber is more expensive. A modest familiarity with Italian is useful in Rome but not absolutely necessary. 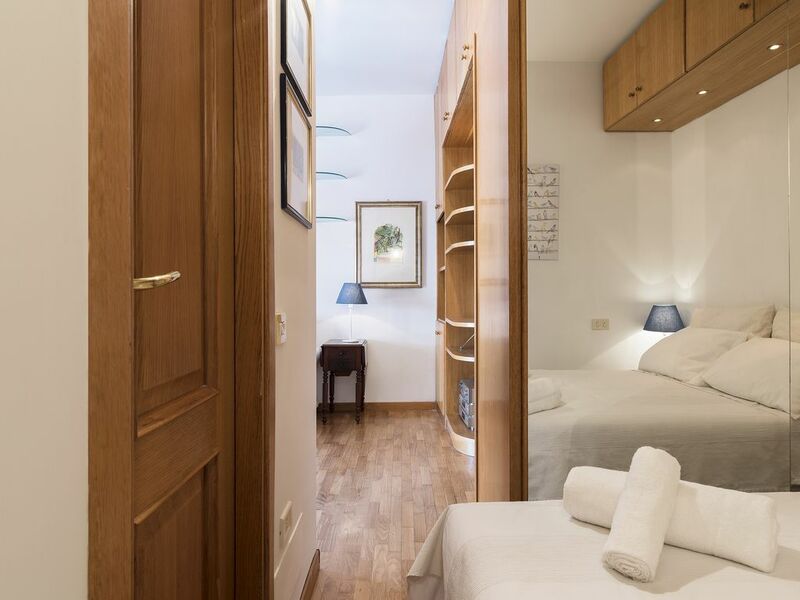 Well presented apartment, compact, close to train and Vatican. We enjoyed our stay at this small but well presented apartment in a quiet location. We arrived from Australia on an early (6.30am) flight into Rome. Gabriel confirmed that we could get early access (at no extra cost), and we met Edourdo at the apartment at 11am. The apartment is easily reached by train from the airport with one change at Trastevere. The apartment is well located, 2 minutes walk to the regional rail station SAN Pietro (Vatican), from which you can get to the Metro line and direct to the main Termini. The super market is a 10 minute walk and the Vatican 5 to 10 minutes. The apartment itself is small but quite functional. Great location. St Peters dome is viable from the balcony. Quiet building and street. Great awning in cast of rain (it did rain while there). So you can sit outside even on rainy days. Heidi Stutzman 21-25 sett H.
We enjoyed our stay at this apartment. I did not realize that there wasn't AC. It worked out fine, as the sun never directly comes in the windows, so the apartment stayed comfortable with the fan. We were there in September so it would probably be a bit warmer in summer months. The overseer was friendly and helpful. All types of public transport are available nearby: train stop San Pietro an many bus stops at 200 m, The apartment is a 40 minute taxi ride from the airport of Fiumicino. We can organize transfer service to and from the airport and/or a chauffeur service/limousine during your stay. On request, we can also provide a breakfast package and/or meals.